A 4-year-old Chicago girl named Florence has been hearing her name a lot lately — but not in a good way. Hurricane Florence swamped North and South Carolina, killing at least 44 people and filling thousands of homes with floodwaters. Florence Wisniewski — known as Flo — wanted to give her name a better reputation. So, she started collecting donations for victims of the hurricane. "She didn't know exactly what was happening, so we started showing her videos and reading her articles. Telling her just what was happening and showing her houses underwater. 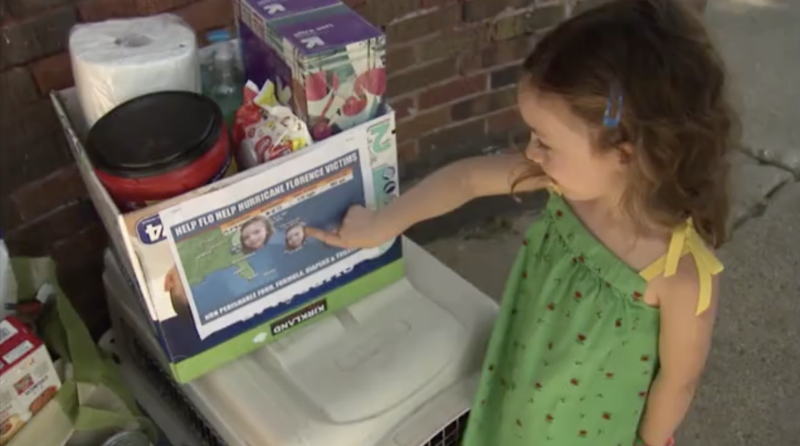 She wanted to help," Florence's mom, Tricia Wisniewski, told local station WLS-TV. The 4-year-old's family rebranded "Florence" by covering a map of the hurricane's path with her smiling face and using it to help collect aid. Her mom shared a photo on Facebook last Friday calling for donations. Florence and her family also put a donation bin on their porch and received hundreds of dollars worth of non-perishable items. Residents in their Chicago community dropped off food, diapers and toiletries for victims of the destructive storm and the family kept collecting until Florence's fourth birthday last week. "People are coming up to me at the store or at a fest and telling me about it and it's been great. Speaks volumes of the neighborhood," Wisniewski said. "I think it's right to do. To help people," Florence told WLS-TV. Now, she has a reason to be proud of her first name.